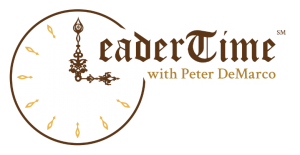 Leader Time℠ is a column that answers your questions about leadership in business and non-profit organizations. The main goal is to provide answers readers can apply, day-in and day-out, to improve their effectiveness and ethics both at work and at home. Whether you’re an experienced leader or a new one, the limited time available to all of us requires knowledge, focus and discipline. Sound priorities are the key to success. Excellence, after all, is a habit that leaders can only achieve in time.